The absurdity of blaming poor and moderate-income people for their circumstances is close to running its course as an effective political tool, particularly as some elected officials more boldly assert their intent to cater to the whims of the wealthy. Take last year’s GOP-led drive to eliminate the Affordable Care Act (ACA), for example. House and Senate leadership introduced bills that shamelessly proposed cutting taxes for rich people while snatching health coverage from 18 million to 30 million people. Lawmakers who spoke publicly in defense of repeal shared their authentic feelings. They trotted out tropes about profligate poor people, ridiculously suggesting they don’t want healthcare because they don’t take care of themselves, and declaring low-income people could afford significantly higher premiums if they stopped buying iPhones. They even implied pre-existing conditions and chronic health problems are indicative of character flaws. These specious, profoundly offensive arguments reflect a lack of compassion, are steeped in harmful stereotypes and rightly failed to resonate with a public acutely aware that access to insurance and preventative care helps avert costly health crises. Moreover, Americans saw lawmakers’ attempt to strip access to health care from millions of poor, low- and middle-income families to finance tax cuts for well-heeled people for the callous act that it was. The eventual failure of the bill, with its clear intent to make life easier for the rich and harder for everyone else, unfortunately didn’t reach a logical conclusion: a chastened Congress willing to heed the will of its constituents. Nor did it stop Republican lawmakers from continuing to use poor shaming as a political messaging strategy. Once health care repeal collapsed, congressional leadership moved full-speed ahead with the deeply unpopular, so-called Tax Cuts and Jobs Act. The law’s passage is indicative of how the nation’s courts have enabled the elite few to hijack our electoral and legislative systems and bend lawmakers to their will. The Koch brothers, corporate lobbyists and other wealthy special interests poured tens of millions of dollars into securing passage of the law. They dedicated significant resources to grassroots campaigning, employing people to knock on doors and bear witness to how the middle-class would miraculously benefit most from a tax bill that showered the overwhelming majority of its bounty on corporations and the wealthy. Of course the bill, which included token tax cuts for people of all income levels, did no such thing. 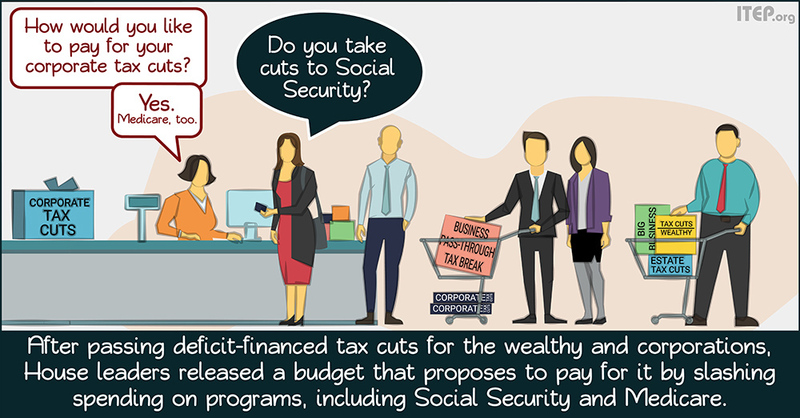 Based on precedent and common sense, a majority believed that deficit-financed tax breaks would ultimately lead to cuts in domestic programs and services. But tax cut proponents treated this valid concern as an abstraction. They promised super-charged economic growth, mostly ignored flagrantly uneven benefits for corporations and the rich, and pretended that comparatively miniscule tax cuts for middle-income people would be life-changing. Throughout the tax debate, lawmakers periodically returned to offensive messaging about the deserving rich and frivolous poor. Sen. Chuck Grassley, for example, attempted to justify all but eliminating the estate tax (which only the richest 0.2 percent of estates paid prior to the new tax law) by declaring that he would rather give money to those who will invest instead of those who will spend it on “booze, or women, or movies.” Aside from being an inaccurate and disturbing caricature of hardworking people, his statements spoke volumes about the disdain that some lawmakers have for the communities they represent. But, here, again, the old rules didn’t apply. Turns out people don’t take too kindly to being depicted as booze-guzzling swindlers who don’t know the value of a dollar while the rich and corporations, whose profits were at historic highs under the old tax regime, are cast as worthy of tax cuts. It’s painfully obvious to most Americans that the core of supply-side economics is siphoning wealth from the masses for the benefit of the wealthy few. Empty trickle-down promises today mean “tough fiscal choices” tomorrow that will weigh most heavily on working people in the form of cuts to domestic programs and services. Republicans passed the unpopular tax bill anyway. And then they resorted to a coordinated public relations blitz to convince the public that being force fed rancid castor oil was for their own good. It seems trite to point out that they exercised no such restraint as they used the tax code to make sure the rich would enjoy ever-larger after-tax incomes. The “debt crisis” to which the proposal refers is due, in part, to stacking more tax cuts on top of George W. Bush-era tax cuts that were still largely in effect. To the extent that the budget blueprint acknowledges tax policy at all, it attempts to reinforce rhetoric about tax cuts growing the economy. The proposal likely won’t see the light of day during this election year, but it’s a clear signal to the public that GOP leaders intend to maintain tax cuts for the rich and squeeze domestic programs. Further, the White House budget proposal released earlier this year and a more recent administration proposal to overhaul cabinet agencies that President Trump called “boring,” indicates the Trump Administration is on board with slashing scores of programs that it has lumped into the category of “welfare.” Which, again, is an attempt to shame people for not being rich. So, here we are. Six months after the tax law’s passage, projections about who would eventually pay for it (working people) and who would benefit most (the rich and corporations) are coming to fruition. By the end of the first fiscal quarter, it was clear that the $1,000, one-time bonuses that scores of corporations and businesses announced just after the tax law passed were a smoke screen. Corporations doled out CEO bonuses and bought back their stock (when a corporation buys back stock, the value of outstanding shares increases) at a record pace, further lining the pockets of the rich. To be fair, multiple indicators reveal the economy is growing. The nation has been in economic recovery for nine years, and, according to the Bureau of Labor Statistics (BLS), has created new jobs for 92 consecutive months. Average workers’ wages have declined since the tax law passed, however. Some workers are bringing home more money per paycheck this year, but that’s mostly due to working more hours. So, enduring criticism that the benefits of recovery are flowing mostly to the rich still stands. Tax reform presented an opportunity to correct this inequity. But instead, GOP leaders doubled down and made it worse. It’s as though they studied trends in income inequality, sought expert advice on how to shrink the widening chasm between rich and poor and then proceeded to draft and pass a tax bill that did the exact opposite. One of the lessons of ACA repeal failure and the unpopular tax law is that disparaging low-income people and using dog whistles to falsely define the poor is, for now, not a winning messaging strategy, nor should it be. It’s akin to poking holes in the bottom of a boat, sending it off without life rafts or vests and subsequently blaming people for drowning. A vast majority of the public sees anti-poor rhetoric for the canard that it is. Our elected officials should heed the will of their constituents and stop catering to the whims of the wealthy to the detriment of the rest of us.